The best stump grinding and stump removal services in Dallas Fort Worth area. Chippers Tree Service offers tree stump grinding and stump removal services in the Dallas-Fort Worth Metroplex for residential and commercial customers. The stump grinding service is the most affordable method to handle unwanted stumps. This stump grinding service consists of grinding the stump 6" below grade level and is the ideal approach for stumps that only need to be grinded to let grass grow over, do small flowerbeds or work that does not require deep space. Tree stump roots can go several feet below grade level, which is why a 6" stump grinding is the most practical method to go with. In addition to grinding the stump, we also grind the exposed root flares that pertain to the stump. 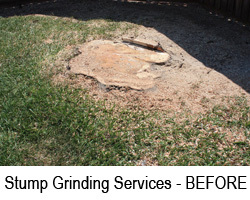 This is the most common stump grinding service performed in the Dallas Fort Worth area. In addition to our 6" stump grinding services, we also offer tree stump removal or what we call the “Deep stump grinding service”. This stump grinding service is highly requested by Dallas Fort Worth customers that want to plant new trees where current trees/stumps are. Our machines have the ability to grind stumps deep enough in order to plant new trees where current stumps are located. For example, in order to fit a 95-gallon tree where a stump is currently at, we would grind the area of where the stump is located 48” wide by 20" deep and this will allow the new tree to be planted in the same space. Our employees have done countless deep stump grinding services for tree nurseries, contractors and homeowners throughout the Dallas Fort Worth Metroplex. Using the proper and state of the art stump grinding equipment, allows us to do your stump grinding services right the first time. Our machines fit through standard 36” inch backyard gates making it easy to get to tree stumps in the backyard. After our stump grinding services have been completed, we use the tree stump mulch compost produced to level the ground. 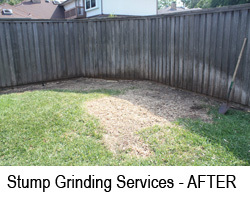 For deep stump grinding service, we backfill the hole for safety reasons when needed. The compost produced from your old stump can also be used as mulch for your flowerbeds or it can be hauled away by our employees. To back up our outstanding stump grinding services, we are a Better Business Bureau accredited business, Angie’s List members recommend and several 5 star ratings from several search engines. 75 percent of our business is from referred and repeat customers that found us to be the best tree service company in the Dallas Fort Worth area. Referrals are available upon request. For a FREE estimate, give us a call at (972) 743-9959 or fill out our online contact form and you will be contacted within 24 hours. Thanks for visiting our website! We look forward to servicing your stump grinding needs.